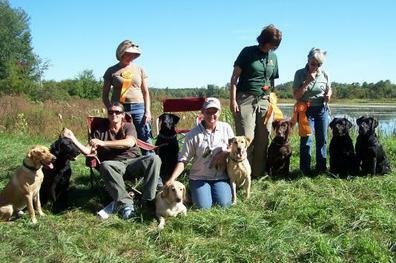 The training that we offer promotes “Help Conserve Game – Hunt with a Trained Retriever”. 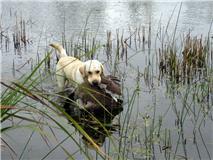 The training of retrievers for hunting has been “measured” in the past by the formation of various clubs around the country whose members were avid waterfowl and/or upland hunters. These men and women, just like you and I today, liked to boast that “my dog is the best in the marsh”! Well, when there was enough “boasting” going on, those hunters/trainers and their dogs formed groups and held competitions. The oldest of these competitions are called Retriever Field Trials and the AKC (American Kennel Club) formed Rules and Guidelines through the years which are still used today. The Retriever Field Trials are very competitive and are a great measure of how responsible breeding and training has advanced our retrievers. The dogs that compete in these events work to become FC (Field Champion) and/or AFC (Amateur Field Champion). When you see these titles in a pedigree you are looking at dogs that have all the qualities you would ever want in a hunting dog and more! For many years the Field Trials were the only events available for our Retrievers to be run in. Today there are many different events to run our retrievers in to help maintain a training “standard” and a performance measure for our dogs. There are Retriever NAHRA Hunt Test Events (North America Hunting Retriever Association), Retriever UKC Hunting Events (United Kennel Club) and the AKC (American Kennel Club) Retriever Hunt Test Events – there may be others as well. We enjoy training dogs for hunting as well as training them to be run in AKC Hunt Tests earning titles which will be associated with the dog’s name always . It is extremely rewarding to train dogs to do what they love and then “show them off” at events such as this. These hunting tests are also a means to keep the dogs “on their game” and in shape during the off-season. There are Hunt Tests all over the country – most weekends - all year long. The Hunt Tests we typically run in our region, Western New York, include Ohio, Pennsylvania, Michigan, New Jersey, Maryland, Connecticut, Massachusetts, New Hampshire, Vermont, and Maine. For these areas the tests are usually held from April thru October. November thru March tests are held in states south, south/west of our “area” and Renee’ is able to train and run tests in those months/areas. The entry level of an AKC Hunt Test is called “The Junior” – dogs that are entered at this level are required to walk obediently on lead (no choke or e-collar – just a “flat, buckle-type” collar), sit in a designated area as instructed by the judges, you may hold onto your dog by the flat buckle collar while you signal to the judges that you are “ready” and the judges signal to thowers out in the field. Tthe test is designed by the judges and each dog entered in a particular Junior event are tested on the same marked retrieves and are scored against a “standard” – the dogs are NOT competing against eachother (as in a Field Trial), they are scored on their ability to retrieve birds as if they were hunting. After the judges are signaled that you’re ready for the birds to be “shot” the judges signal to the throwers out in the field to throw and shoot a bird for your dog to mark – every test/judges are different and sometimes there will be a lot of calling either by you and/or the judges and the throwers may call out in the field which helps get the dog’s attention to look out in that direction. There is usually a shot and then a bird, usually a duck, is thrown for the dog to mark. Sometimes the throwers will throw a live duck and there are gunners out in the field to shoot the duck for the dog – this is called a “live flyer”. After the bird has landed the judges will release you (prior to you running the test the judges will inform you how they will release you) at that time you may, in turn, release your dog to go find the bird. It is recommended that the dog be allowed to hunt for the bird without any direction from the handler – there are instances where the handler may “assist” the dog in finding the bird, but that would be different circumstances. After the dog has found the bird they must deliver it to your hand in the area the judges have previously designated. In order to receive a passing score the average of each attribute must be greater than 5 and the averages from the attributes are totaled, divided by 4, and that average must be greater than 7. After the dog receives 4 passes (each club/event will award the pass with a ribbon) – the AKC awards them a certificate and the letters JH (Junior Hunter) may be officially be added as a suffix to the dog's registered name! There is no age limit, but the dog must be at least 6 months old to be entered at any level in an AKC Hunt Test. As for training for the Junior Level – we can usually get prospective Hunt Test dogs trained to run/pass a Junior test in about 3 months. The next level in an AKC Hunt Test is the Senior. At this level the dogs must walk obediently off lead, with NO collar on, sit at the designated beginning point (called “the line”), without any type of restraint (they must be “steady”) and sit quietly (no whining or barking) until the judges “release” you. Instead of being single retrieves, now the dogs are required to mark two birds (called a double retrieve), and deliver each bird to hand. The dog must now remember where two birds have landed without any assistance from the handler (in most cases). Each Senior Hunt Test will have a double marked retrieve on land and a double marked retrieve from the water. The dogs are also required to “honor” another dog’s retrieve. What that entails is one dog must sit and watch while another dog is “on the line” watching the same birds be thrown and shot and then the “running dog” is released by the judges to retrieve those birds; after that dog is released the judges will then “excuse the honoring dog”. The honoring dog must sit, unrestrained, quietly and still and then walk quietly away from the line after the judge has excused them before any lead/collar is placed on the dog. The third biggest challenge at the Senior Level is blind retrieves. 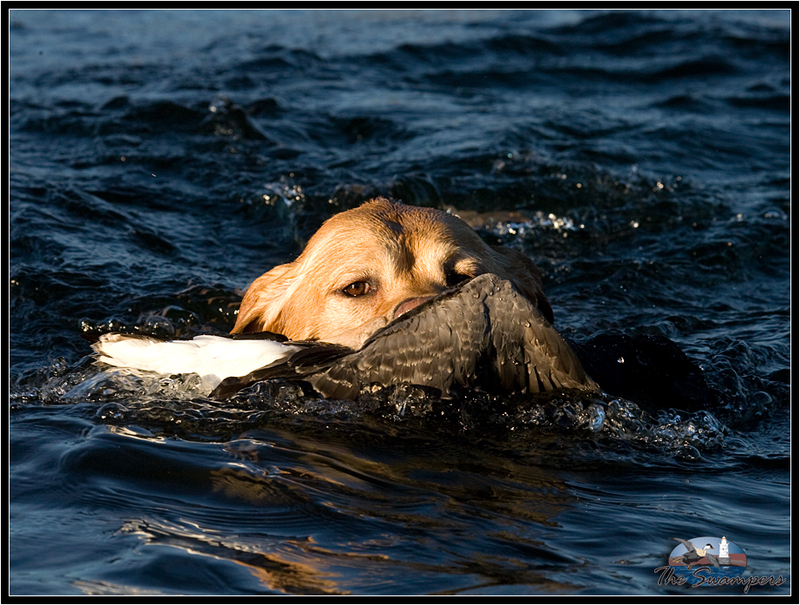 A blind retrieve is a bird placed in a particular spot, designated by the judges. The dogs DO NOT see where this bird is placed. The “spot” is marked for the handler by a bush, an orange stake or ribbon (since it is believed that most dogs are color blind), etc. so the handler can see where the bird is placed. When instructed by the judges, the handler and dog are now a team to "find" the "blind" using casting skills. These casting skills are trained and entail using a whistle blast which the dog is trained to stop, sit and look at the handler for direction; then the handler uses casts, back or overs (right and left) to cast the dog in the direction that would allow the dog to find the bird. The dog is tested, at the Senior Level, on two blind retrieves, one on land and one in the water. The same system is used to score the dogs as at the Junior Level. Now the dog is working towards a Senior Title - if the dog has a Junior Title, then they must pass 4 Senior Tests to receive certificate and the SH (Senior Hunter title) may then be used as a suffix after their registered name; if the dog does not have a Junior Hunt title then they must pass 5 Senior Tests to receive the certificate and SH title. Although there is no age limit and the dog must be at least 6 months old – the dogs running at this level require a lot more training; to train a dog for this level the dog’s maturity is a factor. 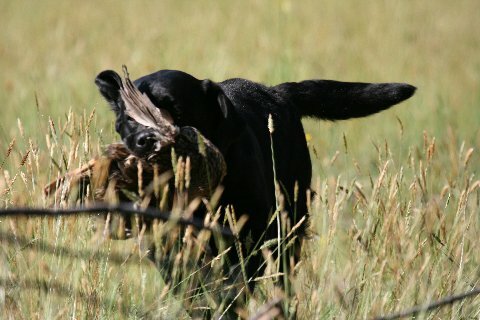 Most dogs can be taught the whistle sit (in the field), the “back” and “over” casts and be “forced on back” (so they go when you send them without seeing anything fall/thrown) at 10-14 months old (again, depending on their maturity, retrieving desire, trainability and marking ability). The whole process of teaching them the casts and then applying the “going when sent, sitting on a whistle and casting correctly” in the field on blind retrieves takes a minimum of 3 months of additional training, just to get them started. To get the dogs to a point where they will be successful at passing a Senior Hunt test may take 3-6 months of training (after the Junior level). This is the highest level, to date, for the AKC Hunt Test Events. At the Master level the dogs are required/tested to be a “finished retriever”. This includes, but is not limited to, multiple marked retrieves on land, water or both; blind retrieves before, during and/or after picking up marked retrieves; honoring - as in the Senior level. It is also required to do a “walk up” which means while the dog is walking obediently with the handler, a bird is thrown and shot and the dog must sit as the bird is in the air and then remain sitting while other birds are thrown and/or the judges give the signal that the dog may be released. It is important to understand that at the Master Level dogs are expected to have fewer refusals/errors/mistakes than at the Junior and Senior Levels along with having a better memory, more obedience and demonstrating better hunting skills thru training and experience. We offer training to this level if the dogs show potential and the owners would like them to achieve a MH (Master Hunter) certificate and title from the AKC. This title may be used as a suffix after the dog's registered name. If the dog has achieved a SH (Senior Hunt) title then they will need to pass 5 Master Tests - if the dog does not have a SH title then they need to pass 6 Master Tests for the MH certificate and title. The training required to be successful at the Master Level would continue after a Senior Hunt title or level of training (if the dog has not run a Senior Hunt test but would be capable of completing them). Our Master dogs stay “in training” until we retire them – mainly because they LOVE it and would not be happy if they weren’t being trained/retrieving as well as there is always something you can teach them that may be a scenario in a hunting situation and/or Hunt Test. The AKC awards the Master Hunter Title (MH) and every year there is an event called “The Master National” which is held in a different time zone and rotates around the country. In this event dogs all over the country qualify (must receive 6 Master passes yearly from August 1 to July 31) and the event is held over 8 days. The dogs are tested on various situations including all of the previously mentioned ones. After a dog passes 3 Master National Events then they are considered a MNH (Master National Hunter), in November 2010 the AKC Board of Directors voted to recognize this title! 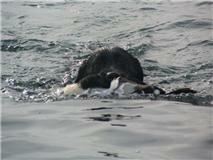 Our training offers “basic” retrieving skills up to and including the Master/Master National Level. Back in the beginning of this explanation we referred to the Retriever Field Trials – today, a good percentage of the dogs that are Master Hunters and/or Master National Hunters are also competitive in a Qualifying Stake at an AKC Retriever Field Trial. If dogs are showing promise of competing in a Field Trial we discuss that potential with the owner, and together, we decide to train towards what would be required in a Qualifying Stake and beyond. 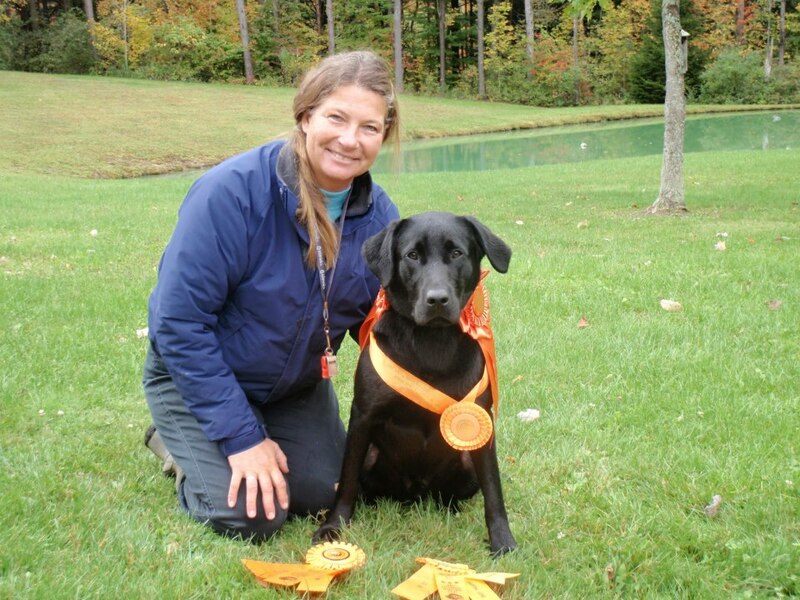 Again, the AKC Hunt Tests are a great “tool” to keep our retrievers in shape and continue with their training to the best of each dog’s ability during the off-hunting season and/or working the dogs and “showing them off” at an AKC Hunt Test. We enjoy running our own dogs as well as dogs we have trained – we also enjoy working with the owners/handlers of dogs we train and seeing them run their dogs in the events. If you’re interested in learning more about the AKC Hunt Test Rules/Events the information can be found at www.AKC.org - click on the top left EVENTS, and then on the left side under AKC Events click on PERFORMANCE EVENTS then on the left side RETRIEVERS and the arrow to HUNTING TESTS - once on that page all the information is listed under “Retriever Hunting Tests” on the left side. We have a retriever club in our area, the Western New York Retriever Club, Inc., they host events, training days and it is a good place to meet people with the common interest of owning/training retrievers!